The ability to read the beach and identify the various formations is really a necessity if you hope to produce better than hit and miss results from your beach fishing adventures. Your eye sight when properly trained will quickly be able to identify various features and guesstimate depths and distances that will go a long way to producing very acceptable results. Lets start at the beginning, what are these formation features? A swell is simply a wave created offtimes 1000's of kilometres away by the pressure gradients and wind from certain weather patterns. Ocean swells more often than not are fairly evenly spaced and are referred to as short or long which describes the distance between them. 50 metres is considered short, 150 plus is considered long. Local or wind swells are created by current and recent winds at or near an area and commonly referred to as chop. Chop has a very short life and drops away very quickly when the winds abate. A bank is shallow sand area surrounded by deeper water and is easily identified as the area where waves rise up to crest and break, creating white water and turbulence that some fish species like to use as cover. Several banks can be noticed when large swells or waves are present, each bank progressively peaking and breaking the very large waves taking away some of its energy and reducing its impact on the beach. A gutter can be many things and comes in many shapes and sizes. Generally they are the trough between the beach and a bank or two banks. Depth is best gauged by colour, light green usually being shallow and darker greens and blue to almost black being much deeper areas. The motion of waves can also give an indication of depth as large waves that were breaking on banks suddenly reform and roll on as a rounded swell. A melon hole is a large deep hole roughly round that usually forms in close to the beach and has white water on its outer edges. Channels and outlets are deeper water breaks in banks and on the edges of mellonholes. These act as an access point for larger fish to enter and leave through clear water as they move from one area to another in search of food. A spit is a narrow point of land that juts out into the water. It may be as little as a shallow bank like structure or a larger dry area that projects well out into the sea. At times on the beach you will come across fast moving currents of water that either run out from the beach, rips, or move across it, sweeps. These sections can be a problem to fish if not approached correctly. Rips are a danger to swimmers and fishermen alike if they get caught in a rip, with the current dragging the hapless individual out into deeper water. Sweeps on the other hand move parallel to the beach and if you remain stationary while fishing in a sweep your line will quickly wash around and back in to shore. A drop off is where a shallow area quickly falls away into deeper water. Close in banks, gently sloping beaches and spits will often have a dropoff on their edge. A drain is small gutter that most times shallows and dries out as the tide recedes. Usually one end is deeper than the other and sometimes exits into even deeper water allowing certain species of fish to slowly withdraw or move into them with the tide. Some will also refer to channels and outlets as drains. Potholes are small indents (up to a few metres, but more often much less) in the sand in smaller gutters and on some banks. These can be a trip hazard when wading onto white water covered banks hiding their presence until your foot finds an unseen hole where solid sand is expected. Fishing in sections with potholes using heavy sinkers will cause a snag like effect as they sink into the soft sand in their sides. A beach or shore break is self explanatory, it is where all waves meet their final end. By the time a wave reaches the beach it has lost a lot of energy, so depending on the depth of that section of beach may barely be a noticeable ripple or could be a crashing wave. 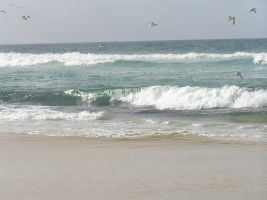 A backwash is the returning water from a wave or waves that has run up a beach. When large waves are present and you are fishing a steepish beach the force of the returning water can be significant, more than enough to drag the unwary down from behind. At times the can be small outward running formed as the result.